I asked a simple question of mathematics to people working in different fields. The question was: How much is 2 + 2? I got some funny answers which I am sharing here. Hope you would enjoy and share this it with your friends. If you have any different, interesting answer to the question 'How much is 2+2?' please let me know. Just put it in the comment box. I remember that I had asked this question to my Mom when I was a kid. I think she did not know the right answer, or was not sure about it, so she said, "I think it is 4, but confirm it when your Dad returns from his office". When my Dad returned at evening, I asked him the same question. Instead of giving the right answer, he said, 'Why you are asking this question?" "Because", I replied, "My teacher has asked this question to me"
"Well", Dad said, "She is a teacher and still she doesn't know the answer? And did you ask the question to your Mom?" "Yes, I asked. She said it is 4" I replied. "If she says it is 4, it should be" Dad said. I grew up, asked the question to many, but I never satisfied with the answers I got. I asked the question to shopkeepers, housewives, philosophers, mathematicians, politicians, cashiers and many other people, but got different answers. Funny, stupid, puzzling ones. When I asked the question to a to be mathematician, his reply was " 2+2 is equal to the square of 2. 2 is the only number which gives you the same answer if we add or multiply it with itself. "But what is the answer? ", I asked, "How much is 2+2?" "Well, that is a simple mathematics," He said, "So find it yourself. If you have any question regarding advanced mathematics, let me know"
I remember that once I had a minor health problem so I went to a General Physician. But instead of telling the health problem, I asked him the mathematical problem, "How much is 2+2?" "Let me check it," the Doctor said. Then he calculated it on a rough paper and said, "It is a complicated problem. But don't worry, I will refer you to a specialist, where you will get the right answer". But instead of going to the specialist, I preferred to meet an Engineer, and asked him the question. He calculated it on his calculator for 15 minutes and then said, "It is approximately 4. To say more accurately, It is in between 3.99 and 4.01"
When I met a local politician friend in a late night party (a place for party politicians? ), I asked the question and he gave me an answer in form of a lecture. The synopsis of his lecture was 2+2 is not 4. 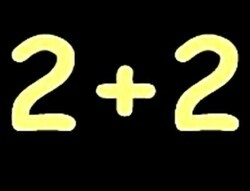 When two twos come together, it is equal to 22, just like 1+1 is 11. One of my friends is a Chartered Accountant. When I asked him, "How much is 2+2? ", without waiting he asked, "How much do you want it to be?" So how much is 2+2? Any different answer?